I think I will always remember my first sermon. It was in May of 2004, and I was preaching what I guess we would call, a candidating sermon at a church where I was being considered to be their pastor. Of course, they really did not have a choice since I was the only one available and the bishop had already assigned me there. But, I was there to preach. I had just graduated from seminary so I, of course, had all the answers. Looking back on that day, 14 years ago, I will have to say, man was I still wet behind the ears. I have had several other “first sermons.” There was the first sermon I preached after being called to be an associate minister. The first sermon I preached after being called, in the same church, to be the Interim Senior Minister, and of course, there was my first sermon here, last June. The one common thread in all of those sermons is I did not hold back, I left it all on the field as we like to say in the preaching world. I believe that the sermon is designed to get people to think, to get their minds moving and to ask questions. I believe the sermon is intended to make some people mad, to make some people glad, to make some people shake their heads, and maybe, to make some people shake their fists. Sure, it would be easy for me to come here, week after week, and string together some pretty quotes so we can all leave here feeling good about ourselves. I could stand here and tell all of you how wonderful you are and what wonderful Christians we all are, but we already know that. My job, well the responsibility of any preacher really, is to say what needs to be said not what you want to hear. A relationship builds between the minister and their flock in such a way that we have a sense of what needs to be said, a where they are now and where they need to be sort of thing, and that is what the sermon is supposed to do. Far too many of my preacher colleagues avoid certain “taboo” subjects because it makes people, including the preacher by the way, uncomfortable. Well, I am here to comfort the afflicted and to afflict the comfortable. In the almost 15 years I have been doing this, I cannot remember a time when I have stood before a group or a congregation where I did not have butterflies. I stand behind the pulpit, and sometimes hold on, so you don’t see my hands shaking. I also stand back here in case you start throwing things, so I have some protection. The art of preaching, and it is an art form, is to inform, form, and transform those who are listening. And, I do not do this alone, I rely on the Holy Spirit to guide me. Kallistos Ware is a retired theology professor at Oxford University and a bishop in the Eastern Orthodox Church. He tells the story of a sermon he once preached in London. He begins by saying it was a beautiful day and that he cannot remember what the scripture passage was or really what the sermon was about. He started to preach, and all eyes were on him, but as he continued, he noticed fewer and fewer people were making eye contact. He says the somewhere in the middle of the sermon he could hear someone snoring, but he soldiered on anyway until he realized he was the one doing the snoring! We have all heard good sermons, and we have all heard bad sermons. I believe I have preached some good sermons and I have also preached some bad one. I have preached sermons that I thought were going to bomb but turned out to be the ones most people commented on. So I guess you never know. Today, we heard from Luke’s Gospel of Jesus in the synagogue where he preaches his first sermon. He is asked to read from the scroll, this is not unusual, and so he climbs the bema, unrolls to scroll to the passage from Isaiah. Unfortunately for us, the scripture ends there, and so you will have come back next week to find out what happens. We call this a cliff hanger or a tease, and it is designed to get you to come back. Well, what we do know is it does not end for him. He has told those sitting in the synagogue that he, Jesus, Joseph the carpenter’s son, is the fulfillment of this scripture and they do not take it so well. As we will hear next week, they lead him outside and attempt to throw him off a cliff. But he manages to slip away. But let’s step back and look at what he has just read because they are just as upset about what he read as they are about what he said. He, Jesus, has come to bring the good news to the poor. He, Jesus, has come to proclaim release to the captives. He, Jesus, has come to recover the sight of the blind. He, Jesus, has come to let the oppressed go free. And he, Jesus, has come to proclaim the year of the Lord’s favor. This is what he has come to do, to relieve suffering and bring a new way to the world. He has come to set religion on its ear, he has come to begin a revival in their hearts and in their minds. He did not come to walk the halls of the Roman legislature to convince politicians to pass laws to force people to do, or not do, certain things. No, he has come to influence people, one person at a time to change themselves and then help others to change. He has come to bring opportunity to those who have no opportunity. He has come to voice to the voiceless and to advocate for those on the margins because no one was advocating for them. He came to call out the hypocritical religious leaders that were making religion about fear and preaching about a vengeful God that was going to destroy them for their sin. He called out the religious elite for bending and twisting God’s word to suit their political needs. He came to preach a message of love in a world that preached a message of hate and division. And he came to leave us away, and a command, for us to do the same thing. I will stand here this morning and boldly proclaim that this scripture has been fulfilled in your hearing for I believe that I have been called to bring the good news to the poor, the spiritually poor that God loves you and God has a place for you no matter who you are. If you think you have done something so terrible that God cannot love you I am here to tell you that there is nothing you can do, nothing, that will make God stop loving you. I am here to proclaim that we no longer need to be held captive to sin and that we should not hold another captive to sin. We should not think of ourselves or others as their behavior, we are all, all of humanity, created in the image and likeness of a loving God and we need to convince ourselves that we are not held back by something we did years ago, that Jesus has come to set us free not because of the blood of the cross but because of the love of God for his creation. I have come to help the spiritually blind recover their sight. Far too many people are blinded by their hatred of others because of their skin color, their religion, the country they are from, their legal status, who they have fallen in love with, how they chose or not to choose how they worship God. We are blinded, sometimes enraged by people who have a different political philosophy then we do, we cannot stand to hear someone not speaking our language or those who need a little extra hand to make it through the day. We need to throw off those things that blind us from truly seeing the other as a blessed child of God that we are to love, and we need to begin that process by looking in the mirror and loving the person we see staring back at us. I have come to free people from oppression, the oppression of hate and the oppression of others. For far too long religion has been used to oppress one group or another and we continue to see it today. There are Christians who believe that no matter what, it is their job to convert others. In the history of the Christian church, there are countless stories of people killed in the name of Jesus Christ because they would not convert. The Protestant Reformation, the Counter-Reformation, the Spanish Inquisition, the Crusades, and all the rest. But how about spiritual death, how about Christians who claim they love Jesus so much that anyone who does not believe the same way they do is going to hell. They believe in freedom so much that they march on legislative bodies to enact legislation to remove those freedoms from others. Or those who merely stand and smirk in the face of people praying differently than they do. My friends, Jesus left us the way and has called each of us to follow that way and that way is merely the way of love. I will ask each of us next time we are going to say something, stop and ask, is this something Jesus would approve of? Am I showing love in what I am saying? Are my actions, or my lack of action helping the situation or making it worse? Am I genuinely showing the love of God in what I say and what I do? Jesus said what needed to be said at all times. Jesus did not think of the political ramifications of what he was saying, and he did not worry about whether people would put money in the collection plate or not. Jesus said what the people needed to hear not what they wanted to hear, he risked it all for the kingdom of God, and he left nothing on the field. I enjoy weddings. Last year I had the honor of officiating at more than 20 weddings. There is something special about being present to witness the covenant relationship between two people; it is a sacred, intimate moment that can also be rather amusing. I could stand here and share a hundred stories about incidents that have taken place during weddings, but we would be here all day. Let’s just say, although I have not seen it all, I have come close to seeing it all. In the Gospel passage from John we heard read this morning, we find Jesus, and his mother Mary, at a wedding in the City of Cana in Galilee. In the first century, Palestine weddings were quite a social affair. They would usually last seven days and be filled with great food, wine, music, and all the rest. The very fact that the wine was running out was not a good thing, in fact, it was a social mistake that the family probably would not recover from. The Steward comes to Mary, so obviously, the wedding was for a close family member and informs her that the wine is running out. She turns to Jesus for help, and he asks, “what does this have to do with us?” Ignoring the remark, Mary tells the steward to do whatever Jesus tells him. Then the miracle takes place. I have said before, there is always more to a story than what we see on the surface. We tend to focus on the miracle of the story but miss the true meaning because we are dazzled by magic rather than what is spiritually going on in the background. There were six stone water pots available to Jesus. According to Jewish tradition, seven is the number which is complete and perfect; and six is the number that is unfinished and imperfect. 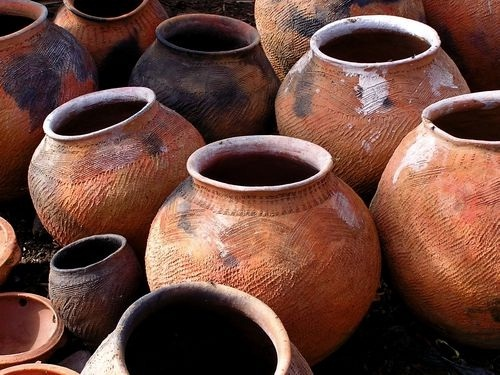 In this story, the six water pots stand for all of the imperfections in the Jewish law. Jesus came to do away with the imperfections of the law and put in their place the new wine of the gospel of his grace. Jesus turned the imperfections of the law into the perfection of grace. But we can go deeper into this passage. The six waterpots held between twenty and thirty gallons of water each; Jesus turned that water into wine. That would provide up to one hundred and eighty gallons of wine! This is an example of why we do not take every passage of scripture literally. What John is saying here is that when the grace if Jesus comes to us, there is enough to spare for all. No wedding party on earth would be able to drink one hundred and eighty gallons of wine. No need on earth can exhaust the grace of Jesus Christ because there is a glorious superabundance in it. What John is telling us is that in Jesus, imperfections have become perfection, and the grace has become illimitable, sufficient, and more than enough for every need. Whenever Jesus comes into our lives, there comes a new quality which is like turning water into wine. What I like about this story is that it is about abundance, an abundance of grace and abundance of love. In Christ, all of our imperfections are removed through his grace and love for us, and then we can be filled with an abundance that we can then share with others. The Rev. John Dorhauer, General Minister and President of the United Church of Christ, has a weekly podcast called Into the Mystic. In this podcast, Rev. Dorhauer explores current events and spirituality and how we can enter more deeply into the mysticism of Christianity. He believes as I do that mysticism is something that is lacking in the church today and that we need more mystics in the church, as well as a few prophets thrown in for good measure. Shortly after the mid-term elections, Rev. Dorhauer released a podcast called “I’m Tired.” He spoke from his heart about how tired he is at the division on our country and in our church. He laments that although we speak in terms of all are welcome, and it is getting more challenging to welcome those who stand in direct opposition to what we, you are I, believe on a fundamental level. The church needs to be a place of healing, but at the same time, the church cannot be a place that harbors hatred of others. He is afraid, as am I that friendships are being laid waste in the process. However, sometimes sacrifice is what is called for when we are called, as all Christians are, speak the truth. The Gospel passage we heard this morning show just what speaking the truth can cost. The passage comes at the end of the ministry of John the Baptist and just before his arrest. He is handing off his ministry to his cousin Jesus, and he is fading away, well not quietly anyway. John stands up for what is right, and he speaks the truth to power, he calls Herod an adulterer, and for that, he is thrown in prison and eventually killed. This is a foreshadowing of Jesus own arrest and murder at the hands of political power. Both Jesus and John knew the cost of their ministry, and they took up the mantle and carried it out. This past week I was involved in a conversation about opinions. I am a firm believer in the notion that everyone has the right to their own opinion. I never try to force my opinion on others, I present evidence, and let you decide for yourself. I encourage people to ask questions and to challenge what I present for I believe that through questioning we clarify our own beliefs, but in the end, you have to decide for yourself. However, I am also of the belief that not all opinions are valid nor are all opinions equal. Opinions based on lack of evidence or fact are not equal to opinions based on fact. You can, for example, be of the opinion that 2 + 2 equals 5. You are, of course, entitled to that opinion. However, facts prove otherwise, and therefore I am going to reject your opinion based on evidence that 2 + 2 equals 4. This is a very simplistic example I know, but it shows that not all opinions are valid. Theological opinions are another area. Get any group of theologians in a room, and there will be as many opinions about things are there are theologians. This is why we have so many denominations and independent churches in the world today, everyone has an opinion, but not all opinions are equal or valid. One of the things that drive me crazy is proof-texting. This is where I take a line from Scripture to try and prove my argument as being biblical, and I am attempting to use the text as the proof of my argument. The study of Scripture needs to include not only the text itself but an understanding of what was going on at the time these things were written. As much as we want to believe these texts speak to us today, and I believe they do, they were written to particular groups of people dealing with specific things in their history. An understanding of those things becomes of paramount importance if we are going to understand what is being written. We also an understanding of the literary forms of the day. Allegory and imagery were a large part of the writing of the day so not everything is to be taken literally or we would believe that Jesus was a vine, a door, a lamb, etc. The imagery was a common form of literary use in the first century, and an understanding of that is essential. We also need to drill down on passage. Not every passage of Scripture says what we think it means on the surface, so we need to drill down. What came before and what comes after are all critical questions. Sometimes what is not said is more important than what is being said. So just picking a verse from Scripture to prove your point, or disprove my point, can be very dangerous indeed. There have been many times in history when men and women of faith have been called upon to be beacons of hope in a world gone mad, and I believe we are in one of those times now. Christianity is being used by all sorts of people to say all sorts of things, some of them right and some of them bad. I am a simple theologian that weighs everything by the simple principle of love. Is what I am doing showing love to God and love to neighbor or is it harming. Is the policy I support showing love to God and love to neighbor, or is it damaging. Is my belief based on love or hate, because if it’s based on Christianity, it has to be based on love we have no other option. However, love brings risk, and we have to be willing to take that risk. In my From the Pastor column this week I wrote about the start of our Confirmation program. I am excited about this because six young people have decided that they are going to make a public profession of their belief in Jesus Christ and reaffirm the promises that were made for them years ago in their baptism. This will not be an easy journey for them, and they might have to make decisions, some might even make the decision not to make a Confirmation, and that is okay as well. However, they understand, and we need to understand, that any decision to stand and say this is what we believe just might cost us. In Rev. Dorhauer’s podcast, he speaks of his worry of losing relationships based on his beliefs and the stances he has taken on issues, and it is something I also worry about. I know I have lost friends over my positions, and with some family members we have to avoid specific topics, and all of this makes me uneasy. My views are not always popular but I have to do what I believe is right and if it costs me, well, so be it. “So, because you are lukewarm and neither cold nor hot, I am about to vomit you out of my mouth.” This passage is a warning not only to the church but to church folks, we cannot be lukewarm, we cannot be fence-sitters, we have to stand up for what is right, we have to be the voice of the voiceless in society no matter what it costs us because, in the end, I want to hear God say to me, “well done good and faithful servant” and not the line from Revelation. It has been said that the Christmas Eve sermon is the Super Bowl of Sermons. Ministers, of all denominations, have been worrying about this one sermon for months, writing, rewriting, editing, and all rest. There is a ton of pressure to get it right. When preparing for “the big show” as I like to call it, I remember the immortal words my seminary professor told me, “When preparing for any sermon remember the 3 b’s, be brief, be brilliant, and be gone! I am not so sure about the brilliant bit, but I am going to try and be brief, so we can all be gone. One of my favorite Christmas specials is Charlie Brown Christmas, I mean it ranks right up there with the Great Pumpkin. It is incredible to me how a complex theological concept as the Incarnation of Jesus Christ can be summed up in such a beautiful and simple way. The other thing I like about the story is that it pretty much sums up how we prepare for Christmas. We see the kids all gathered to put on the school play. Charlie Brown is the director, I believe he reluctantly takes on the role, but when he does, he grabs it with both hands. But he wants it to be perfect to include the ideal Christmas tree. So he sets off in search of that tree but can only find manufactured ones, not the perfect tree like the silver ones with the color wheel that I remember from my childhood, but some metal monstrosity. Then, like magic, there it is, the Charlie Brown Christmas Tree. Sure, it has its problems, and perhaps it has seen better days, but Charlie is optimistic that all work out, so he talks it back to the school where all the children are rehearsing for the play. Well, the tree is not all its cracked up to be, and after placing one ornament on it, it looks even worse. 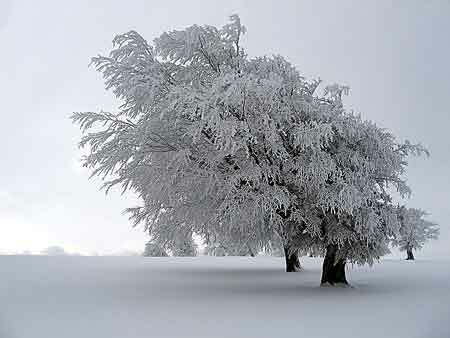 Charlie goes on, in a lament that would make the writer of the Psalms proud, about the real meaning of Christmas. Then Linus, with blanket on tow, comes on stage and recites to story. It ends with them all dancing, not unlike this service will finish tonight. The point of all of this is that in the hustle and bustle of the world and preparation we forget what the true meaning of Christmas is all about. Sure, it’s about family and exchanging gifts but it has to be more than that what we are commemorating is an extraordinary act, God, the creator of the universe, becomes part of his creation to show that there is a better way and that this better way is the way of hope, peace, joy, and love. In the first reading tonight the Prophet Isiah spoke of the light and that the people who have been walking in darkness will now see this light. We began this service tonight by lighting the final candle of the Advent Wreath. Each of the four weeks before this, we have lit one candle, each one with its own theme, hope, peace, joy, and love but tonight we lit the central candle, the one that represents Christ and is the culmination and fulfillment of all of the others. Sure, each one brings light into the world, but when brought together they all shine bright and light the way for us to follow. It is that central light that makes all of the other lights possible for it is the light of life. In the Charlie Brown story, Linus reminds the kids, and us watching, what the true meaning of Christmas is all about, God so loved the world that he send his only son that all who believe in him may have eternal life. This story, this Greatest Story Ever Told is a love story. We, and by we I mean us religious people, have made the story way too complicated with all the rule about who is in the club and who is out of the club. We have caused wars and a tremendous amount of suffering in this world because of what some people feel this story means. But what the story suggests is a radical sense of love and welcome so extreme that is made people nervous. This is a story of inclusion. He was born to the poorest of the poor in one of the worst places on earth. He was turned away at every door his parents knocked on until the only place left was one where the animals lived. But even with all of that, he is the King of Kings and the Lord of Lords, the Prince of Peace and the one that brought in a radical new way to live. This story is about hope, hope that we are not alone and even when things in our lives are at their worst, God is still with us, right beside us walking with us and sometimes carrying us. This story is about peace, the peace that passes all understanding, the peace that comes when we realize that we are accepted by God no matter what. 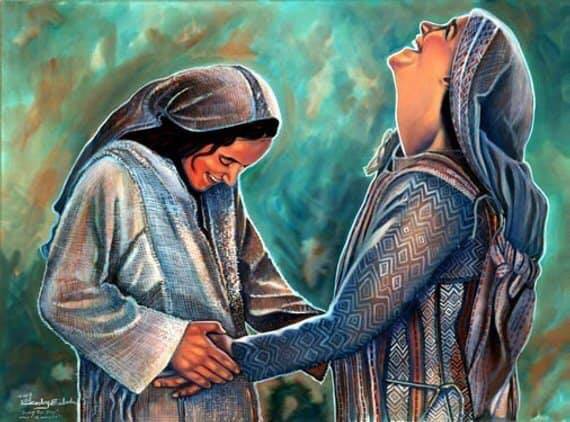 This is a story about Joy, the joy that Mary felt when she sang to her cousin Elizabeth that her soul magnifies the Lord and her spear rejoices in the God who has saved her. And this is a story about love, radical love, love that knows no class system or status, the love that God has for each one of us just the way we are. This love that summed up all the law and the prophets with his new commandment to love God and love your neighbor, yes your neighbor and not just the ones next door and your neighbor includes those who hate us and don’t love us back. In a few moments we will turn the lights off, and the only light will be that of our Advent Wreath. From that center candle, the one representing Christ, the flame will be brought out to all of you to light your candles. As the flame passes to each of us the room will move from darkness and into light, and we will sing the song Silent Night. The symbolic act of passing the light from one to another is in the hope that the light of Christ will never go out and that we, each of us, will take that light out into the dark world, the light of hope, peace, joy and love that this world we live in so desperately needs. On this day, Gracious Lord, you come to us as Word, as light, as flesh. Teach us to know you so well that our lives may befriend this world you have made, in the name of the Holy Trinity: Father, Son, and Holy Spirit, one God, now and forever. Amen. Hanging on the wall, downstairs in my study, are two hand-painted Icons that I brought back with me from a trip to Romania many years ago. They have made every move with me and are usually the first things I hang on the wall when I move to a new church. They are Icons of Jesus and his Mother Mary. It might sound strange that a minister of a Reformed/Protestant theological tradition would have icons hanging on the wall of his study, but for me, they are a constant reminder of why I do what I do. Now, don’t get me wrong, I am a believer in the much of the Reformed theological understand of the Incarnation of Jesus Christ and the role that his mother played in all of that, however, at the same time, I am also critical of the seeming removal of Mary from the theological understanding of the story of Christmas for Mary is not just a player in the story, she is the beginning of the story and if we take her out or reduce her to some meek and mild participant, we lose a large part, if not the central part of the story. I say a central part because if this young girl, from a backwater part of the Roman Empire, had not said yes to the Angel when he visited her, we would not have the rest of the story. This may shock you, but Mary had to say yes, she had to give her consent to God for the rest of the story to unfold, and by doing so she repaired a breach in the relationship between God and humanity that goes back to the time of Adam and Eve. I know we like the sweet story of two people, naked and afraid in the Garden of Eden looking for something to eat. God comes along and tells them that they can eat from any tree or plant they want, except this one, so naturally, that is precisely what they do. Now I know we also like to blame Eve for what happens next but Adam, like Mary, was a willing participant. Eve did not hold him down and force feed him whatever it was they ate I don’t think food had anything to do with the story, it came down to the arrogance that humanity knew better than God, a sin, if you will, humanity is still guilty of. However, along comes Mary, and she says yes and changes it all. However, what about Mary and why should we care about her or this particular passage that has been described as boring? For starters, Mary is the Mother of God. So we honor Mary because she is the mother of Jesus but, we also admire her for what she did in saying yes to God. Mary bursts on the scene in the opening passage of the Gospel of Luke. Luke’s Gospel is the only one that contains the story of the Angel coming to Mary. Tradition tells that Mary since she was the only one present, told the story herself to the writer of the Gospel. We do not get much a glimpse into her life other than what tradition tells us. Mary was the only child of Joachim and Anna, an older couple that had prayed to God for a child. We are told that she was raised in the temple and at a certain age was set to be married as young girls would have been. She was not more than a teenager of 13 or 14 years when the Angel came to her. Mary was from Galilee, which has been described as the armpit of the Roman Empire. As a female, she would have been considered property first of her father then of her husband. She had no say in what happened to her or whom she would marry. She could own no property and had no money of her own. She was utterly dependent on others for her care and wellbeing, and this is what makes this story so extraordinary. We know the story, the Angel comes to Mary and tells her that God has favored her and that she has been chosen by God to bring his Son, the Savior of humanity, into the world. At first, she is confused as I am sure any of us would be, and she asks how this is possible. How is it that she is going to give birth since she “knows not a man?” The Angel proceeds to tell her that it is the power of the Holy Spirit, which I am sure, does not make the situation any more comfortable. For the sake of space the story is condensed and seems only like a few moments in time, but I imagine that this was not a quick or easy decision for Mary. Mary knew the consequences of what she was contemplating. Mary knew the fate of a woman who found herself “in the family way” and did not have a husband. The Jewish law of her day would have seen her stoned in the center of the city while her parents watched or maybe even participated. This was a death sentence for Mary, and she knew full well what would happen to her. Scripture tells us that when she told Joseph he was “going to send her away quietly” to spare her life but also spare him any embracement. Everyone knew they were engaged and everyone knew that he would have been the father. Of course, he would not meet the same fate as Mary; only the woman was killed for adultery. However, after wrestling with the question Mary says to the Angel, be it done according to your will, a sentence her Son would utter the night before his crucifixion. Mary agrees, give the Angel the go ahead and she is trusting in God, and an unbelievable amount of trust, she is entrusting her very life to God. God has, in one sense, asked her to sacrifice her very life for God and she, this young girl, said yes. Other than the brief mentioned of what happens next that I have already said the only other thing we know is that the same Angel came and visited Joseph and told him all would be well. He is also being asked to risk everything by taking her as his wife and raising this child as his own. Then we come to today’s beautiful Song from the Gospel of Luke. This is a song of praise, it is a song of defiance, and it is a call to action. This is the statement of a young girl, with no voice in her society, that a moral, social, and economic, as well as a spiritual revolution is about to begin and the world will never be the same. The voice of a young, Palestinian woman, is calling for a new way to live. Mary, now “great with child” goes off to visit her cousin Elizabeth, the soon to be the mother of John the Baptist. Scripture tells us that when Elizabeth heard Mary’s voice, her baby leaped in her womb with joy. She encounters Elizabeth and recites the passage of Scripture we listened to this morning. Mary does not complain about any of it; her first words are to praise God for the gift that has been bestowed upon her. She is joyous that God has chosen her and she wants to tell the world about it. As I have already said, Mary was from the back of beyond. Forget for a moment her gender and all that came with that she was the poor of the poor. God did not choose the daughter of the King or even the daughter of some middle-class person; he chose the poorest of the poor. He came to Mary, just as she was and found favor with her. God has come to the worst place and found his servant. The message for us is God loves us just as we are. She then tells Elizabeth that “surely, from now on all generations will call me blessed.” Not because of anything that she has done, other than saying yes, but because of what God has done to her and through her, “for the Mighty One has done great things for me, and Holy is his name.” It has never been about Mary; it is always about Jesus. In the icon I mentioned earlier, Mary is not depicted on her own, in fact, Mary is never depicted on her own because it is not about her, and it is always about her Son. In the icon, Jesus is sitting on her lap, and Mary is pointing to him, just as a prophet points the way, Mary, who in some ways is a prophet, is pointing toward Jesus. We honor Mary not for what she has done but because she pointed the way to Jesus. She goes on to say why this is happening, “His mercy is for those who fear him.” A better word would be awe but let’s stick with fear for now. Then the revolutionary statement begins. I mentioned already the link between Eve and Mary, who is also called the Second Eve. The sin of Adam and Eve was arrogance and pride. Arrogance and Pride are the root of all sinful behavior and what Mary is saying that it has been reversed. If we set our lives besides that of Christ our last vestige of pride will be taken away. Christ enables us to see ourselves, and that is a deathblow to pride. Through these words, Mary is announcing that the moral revolution has begun. Christianity has, or at least it is supposed to have, put an end to the label of the world and prestige. The problem is we do not honestly believe this. Some have taken Christianity and held it so tight they refuse to let others in. 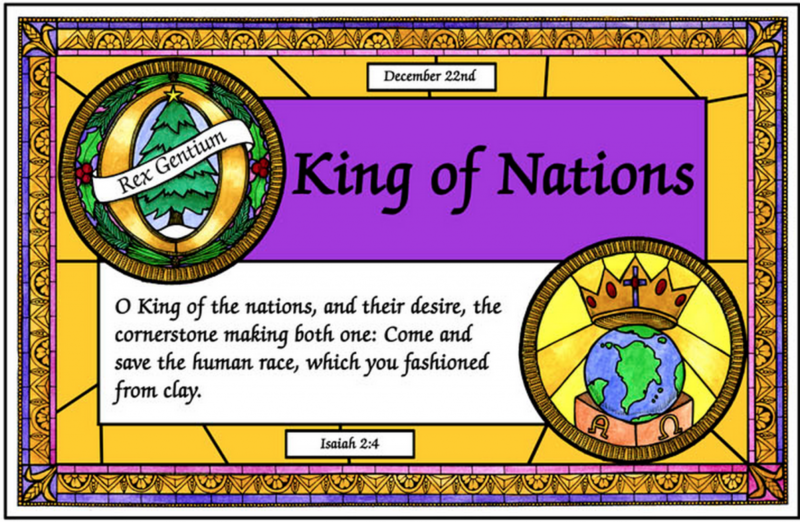 The message of Christmas and Mary’s Song is that Jesus was born for all of humanity not just a particular sector of it. Remember, Jesus was born in the worst place on earth, he was born with no roof over his head, he had to flee persecution to another country, and he was unjustly convicted of a crime and killed for political reasons. Mary is announcing that a social revolution is beginning. The world of first century Palestine was not unlike our society today. The message our world sends is it all about the stuff we have, the big car, the big house, etc. The very way we have chosen, as a society, to celebrate the birth of Jesus is by giving gifts and going into a massive amount of debt to show our loved ones how much we love them. Mary has come to tell us that a change is coming and economic revolution is upon us when all will have what they need, some of us are still waiting for that revolution to begin. The point of this is to remind us that the Christmas story is not only about the birth of a tiny baby that would change the world, but it is also the story of a defiant young girl standing the public square and shaking her fist and saying “no more.” This person who was considered no more than property has just announced to a world that would be happy to see her stoned to death for adultery, that the world as they know it is about to change. The story of Christmas begins with a young girl saying yes. The story of Christmas continues with that same young girl announcing to the world that change is coming and we better be ready for it. The story of Christmas is about a baby being born so poorly that he has no place to lay his head other than a place where animals get their food, also an indication that he will feed us spiritually with his very life. 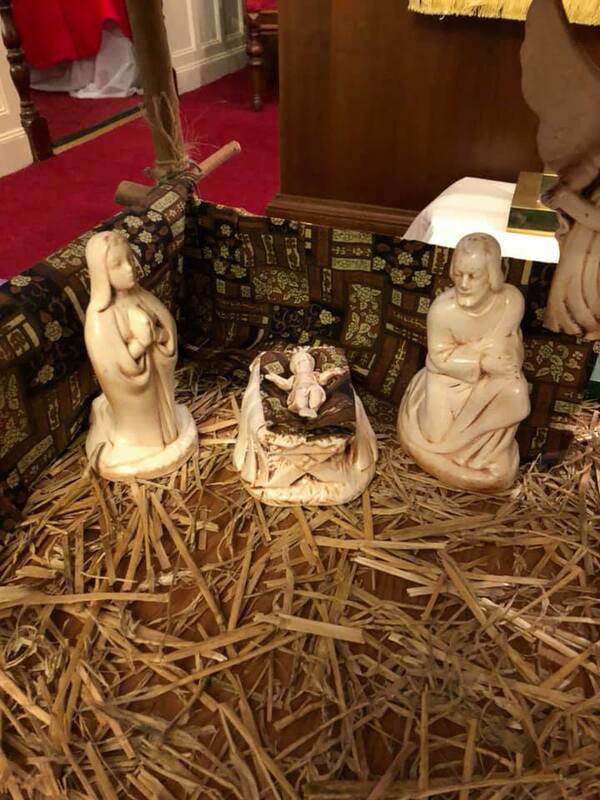 So the story of Christmas ends with the reassurance that no matter who you are, no matter where you are on life’s journey, Christ was born for you, just as you are. 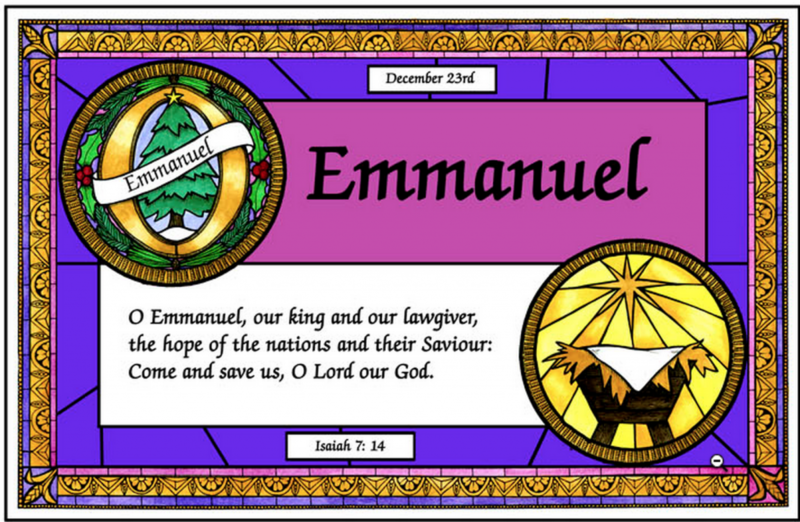 O Emmanuel, Rex et legifer noster,exspectatio Gentium, et Salvator earum:veni ad salvandum nos, Domine, Deus noster. O Rex Gentium, et desideratus earum,lapisque angularis, qui facis utraque unum:veni, et salva hominem,quem de limo formasti. And as we think of those leaves, and the passing of Winter through to the hope of a Springtime when life will emerge from the frozen earth, we remember that we also are a part of that cycle of death and rebirth, that the seeds we sow in this life will fall to the ground with the potential to grow and be fruitful. All: We praise your glorious name! 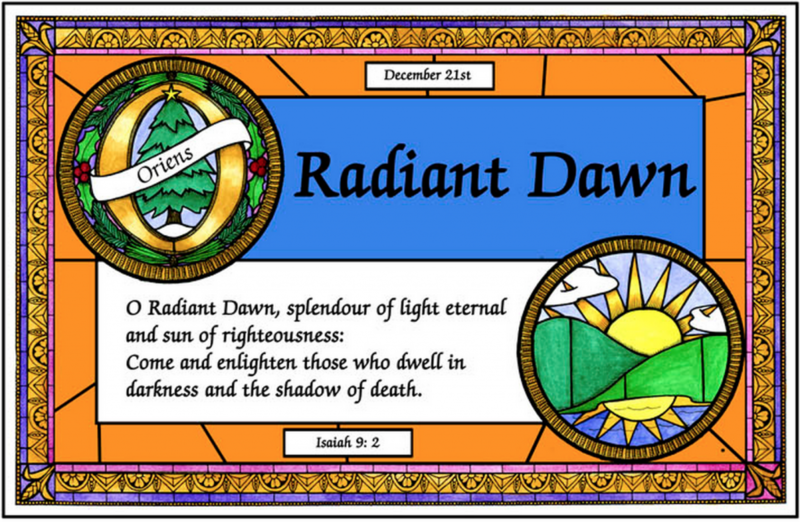 O Oriens,splendor lucis aeternae, et sol justitiae:veni, et illumina sedentes in tenebris, et umbra mortis. The people walking in darkness have seen a great light; on those living in the land of deep darknessa light has dawned. “Arise, shine, for your light has come, and the glory of the Lord rises upon you. See, darkness covers the earth and thick darkness is over the peoples, but the Lord rises upon you and his glory appears over you. O Clavis David, et sceptrum domus Israel;qui aperis, et nemo claudit;claudis, et nemo aperit:veni, et educ vinctum de domo carceris,sedentem in tenebris, et umbra mortis. “Of the greatness of his government and peace there will be no end. 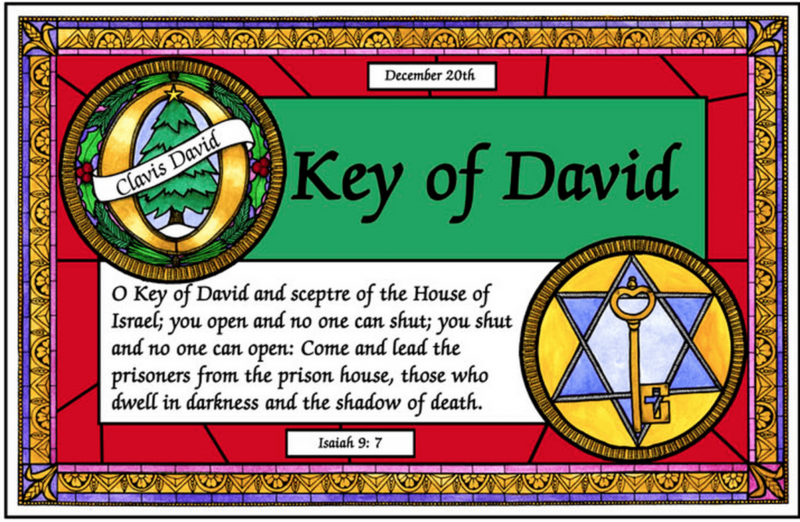 “…to open eyes that are blind, to free captives from prison and to release from the dungeon those who sit in darkness.